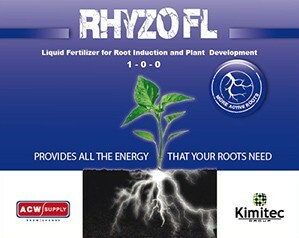 Kimitec Rhyzo FL Liquid is a new type of root enahncing additive and bio-nutrient. Rhyzo is a new formulation and an alternative to products based on hormones. Kimitec Rhyzo FL Liquid is a new type of root enhancing additive and bio-nutrient. Rhyzo is a new formulation and an alternative to products based on hormones. The high rooting power is based on the specific aminogram, b vitamins and high Phosphorous concentration. Kimitec Rhyzo is particularly indicated for encouraging rooting, and activating the root system, thus increasing the growth potential for all type of crops (horticultural crops, fruit crops, citrus and olive trees, nurseries, etc) during the initial stages of the vegetative cycle.